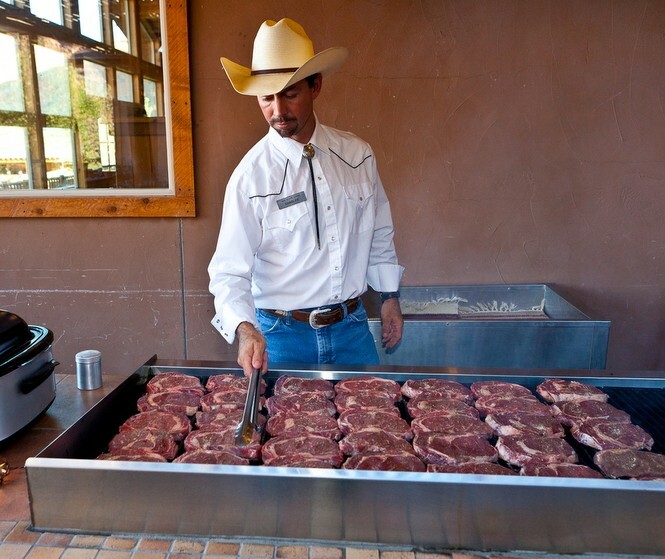 If you're staying in Moab at the rustic Red Cliffs Lodge, the Cowboy Grill restaurant there is a no-brainer. But it's also a terrific option for anyone visiting Moab and its surrounding sights. For a taste of the old west, the Cowboy Grill is the perfect place, with plenty of cowboy-themed menu items to match the western decor. Meat is the main attraction at Cowboy Grill and options range from the house specialty, Prime rib, to lamb chops, pork chops, barbecued pork ribs, beef steaks and elk medallions. However, there are also chicken, fish and even vegetarian choices, too, such as a veggie stir-fry, veggie kabobs, and a grilled Portobello mushroom. The elk medallions at Cowboy Grill are excellent: tender and rich, and served with sautéed vegetables, a choice of side dish (baked potato, mashed potato, dirty rice, etc.) and fresh warm bread. I can rarely resist a rib eye when it's on the menu, and my 16-ounce boneless rib eye steak was cooked to perfection: exactly medium-rare, as ordered. Also beautifully cooked and delicious was the Ruby Red Creek trout, coated in a light breading and broiled until just flaky, but not dry. If you're adventurous, try the "Bull Fries," aka Rocky Mountain oysters. The Cowboy Kabob is also terrific: a generous serving of three skewers of grilled beef, red onion, peppers, squash and mushrooms served with teriyaki dipping sauce.